LA Salvadorians, supporters demand Temporary Protective Status and residency | Fight Back! 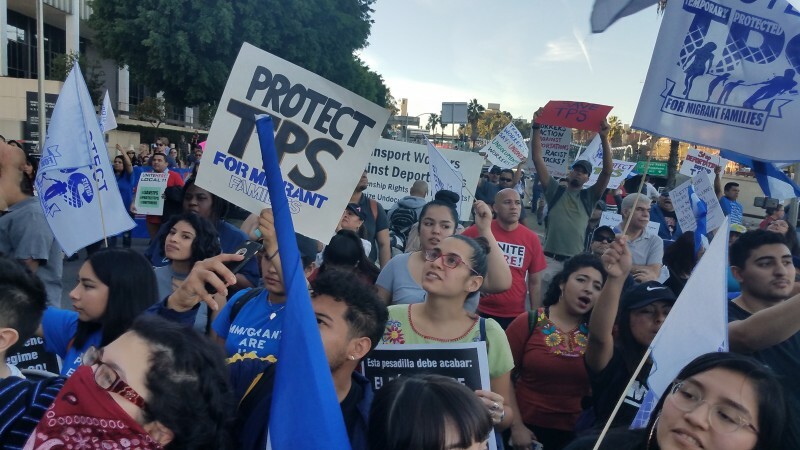 Los Angeles, CA - Over 1000 Salvadorians and allies marched in downtown LA, Jan. 13, to demand Temporary Protective Status (TPS) and residency. The loud and enthusiastic rally denounced Trump for his racist and insulting comments against Africa and El Salvador, pointing out that U.S. interventions have caused misery, poverty and the mass displacement of millions in Central America and Africa. Led by CARECEN and NDLON, the protest included CHIRLA, UNITE, SEIU, many youth, and a delegation of Centro CSO. Centro CSO felt it very important to join the protest to show solidarity with the Los Angeles Salvadorian community, which is the largest in the U.S. The rally took place at the historic La Placita, the site of many past rallies. Speakers called for uniting and continuing the fight by organizing protests, building a movement and also voting to defeat the right-wing racist Republicans in the U.S. Congress. CARECEN called for an effort to work to defeat in Bakersfield, California Congressman and House Majority Leader Kevin McCarthy, who attended the Trump ‘shithole’ meeting, where he remained silent. Centro CSO in Boyle Heights neighborhood has for years fought for the rights of the undocumented and is working with the Legalization for All Network to push for legalization for all, no guest worker programs, and no deportations.